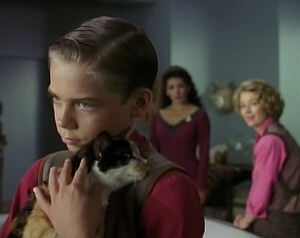 A young boy's grieving over the sudden loss of his mother is interrupted when an alien intruder recreates her. You couldn't have had an episode like this in TOS, since Kirk's Enterprise didn't have families aboard. Thus, this is uncharted territory for Star Trek, an acknowledgement of a reality the original series never had to deal with. It's long past due that TNG addresses it. Bringing up Yar helps reinforce things Data learned way back in "Skin of Evil," and shows that Data is still learning how facing death is an important element of the human condition. Riker opines that, if we felt the death of everyone as keenly as we feel the death of those close to us, "human history would be a lot less bloody." I posit that, if we felt the death of everyone so intensely, nobody would be able to function in day-to-day life. After all, somebody dies every few seconds, on average (citation needed). In the 24th Century, with humans having expanded so heavily into space, it would be fair to assume that people are dying even more frequently, given the greatly increased size of the human race. With all those deaths weighing down on everybody at such a rate, I think the entire human race would probably commit mass suicide. There's some interesting cinematography going on in the scene where Troi tries to get Worf to open up about his feelings over Marla Aster's death. It's heavy-handed, to be sure, but when Worf is refusing to cooperate, they are both obscured by a mesh in the foreground. When Worf relents and starts talking to Troi, the mesh is removed. As somebody who has recently lost a parent, I am better equipped to say that the writing is thoughtful and respectful of the many ways such a loss can be dealt with. It succeeds in being genuine where it could have easily come across as strained or pretentious. Just when the story starts to get a little too self-indulgent with the soap-opera, there's a sci-fi twist that makes it Star Trek. The arrival of the fake Marla Aster is a little horrifying, in that it's hard to imagine a worse way to mess with a child's mind and well-being, right when he's at his most fragile. Even though the story appears to focus on a guest character, the boy Jeremy, the writers still manage to give important time to every single main character, which is a pretty rare accomplishment. This episode has a lot in common with "Hero Worship," another episode that deals with a young boy learning to cope with the death of his parents. Even though he bonds with Worf to "become brothers," we never hear of Jeremy Aster again.